Nic Groom will make his first start for Saints in Saturday’s Aviva Premiership clash with Wasps at Franklin’s Gardens (kick-off 3pm). The South African has come off the bench in the first three games of the season, including scoring twice on his debut, against Bath, on the opening day of the campaign. The summer signing, who joined from Super Rugby side Stormers, replaces Lee Dickson, who is not in the matchday squad this weekend. There are four further changes to the team that lost 27-12 at Saracens last Saturday, with Sam Dickinson, Jamie Gibson, Harry Mallinder and Ben Foden coming in. Mallinder is in for Luther Burrell, who was knocked unconscious at Allianz Park last weekend, while Gibson comes in for the benched Teimana Harrison, who was forced off with a shoulder injury last weekend. Ken Pisi makes his 100th appearance for the club, while Michael Paterson drops to the bench, as does Ahsee Tuala. Dylan Hartley remains out with a sore back, with Mike Haywood again starting and Charlie Clare on the bench. Scotland Under-20 centre Rory Hutchinson is also among the replacements. Meanwhile, Wasps will be without influential winger Frank Halai, who misses the game with a hamstring niggle. However, there are recalls for Matt Mullan, Sam Jones, Nathan Hughes and Josh Bassett. 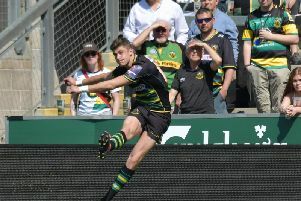 Saints: Foden; K Pisi, G Pisi, Mallinder, North; Myler, Groom; A Waller, Haywood, Brookes; Lawes, Dickinson; Wood (c), Gibson, Picamoles. Wasps: Miller; Wade, Daly, Gopperth, Bassett; Cipriani, Simpson; Mullan, Taylor, Cooper-Woolley; Symons, Gaskell; Jones, Thompson, Hughes. Replacements: Johnson, McIntyre, Moore, Myall, Young, Robson, Eastmond, De Luca.